Our posts on Philadelphia cover the art museums pretty well, but they omit certain important aspects of my experience there. 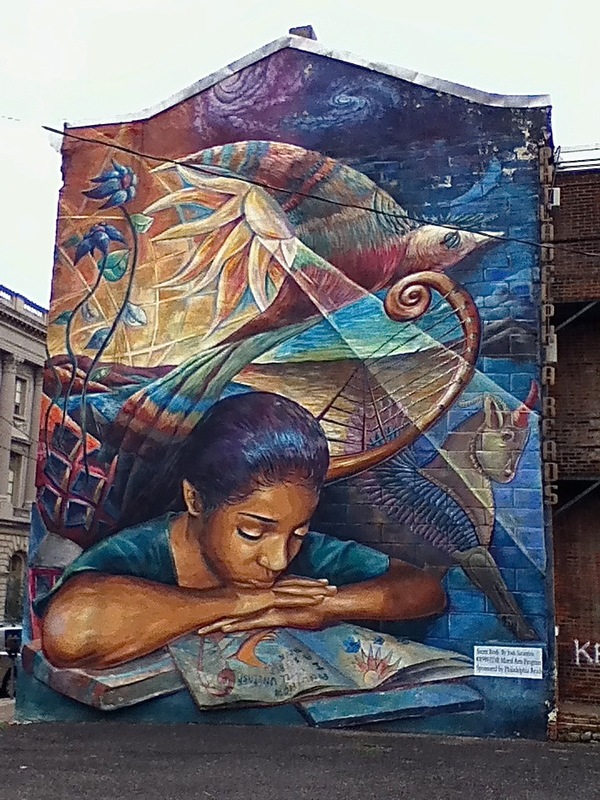 The city of Philadelphia does a lot to encourage the arts. While we were there, I was fascinated by a public art project called "Open Air." I did mention that the first night we were there, as I closed the drapes I noticed a great number of searchlights playing across the sky. Was a giant used car dealer having a grand opening? I tried to photograph it, but a light rain streaked the window of our motel room. I went to bed puzzled. This light show went on every night that we were there; the weather being mild, I went outside every night to watch it and try to photograph it. I didn't report all this, because neither my photos or video capture the project's high-energy beauty. Later research revealed the project's background. 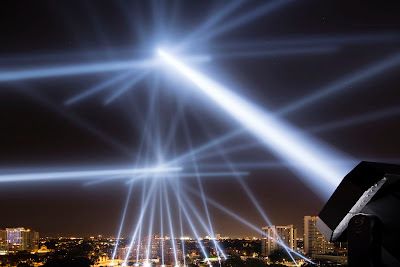 Designed by Rafael Lozano-Hemmer, "Open Air" consisted of 24 robotic searchlights situated on a half-mile stretch of Benjamin Franklin Parkway, the boulevard in front of our motel. Here's the weird part. The movements, as well as the brightness, of the searchlights is controlled by audio messages from the general public, submitted online or through a free application on iPhone—messages such as "Happy Birthday, Joanie," "Please marry me," and rappers laying down rhymes. The application allowed listening to the message while watching the matching light show, which I didn't try. I grabbed a photo from The Huffington Post to give you an idea of the visual effect. Our motel in Philadelphia, the Best Western Center City, must have been a premium property at one time. Not only does it have an excellent location in the arts district (with lots of free parking), but also an interesting y-shaped layout that is both unusual and efficient. However, it is getting a little run-down; the main problem during our stay was that one elevator was broken the whole time, leaving only one elevator for a very large motel, and it made clunking noises when it stopped, causing the Japanese tourists to titter and point with alarm. The motel's least-expected feature was that the doors were totally locked at 10 p.m. and not opened again until 6 a.m., something I've never seen though I've stayed in hundreds of motels. I discovered this by unlucky accident. One morning about 5:15, I went outside to put something in the car. When I tried to return to our room, the motel was locked, every entrance; the key-card readers were non-functional. I thought surely there would be security at the front desk or somewhere; all I found was a hand-scrawled notice that the motel was locked at those hours, and to ring for assistance. The buzzer didn't make a noise. I banged on the front door for awhile, but there was no response. What a funny situation. No phone. No iPad. Not even a bench to sit on. At least the temperature was mild. To pass the time, I went over to the large convenience store on the corner, which is open 24 hours a day; a police station is just down the block, and several officers, both uniformed and plain clothes, came in while I was there. I trolled the aisles for awhile, then bought a Diet Coke from the fountain and went back to the entrance of the hotel. At 6:05, a sleepy guard trudged to the door and opened the bolt without a word. I made a few excited comments about being locked out; he just trudged to the other door without a response. Oh well, a harmless little adventure. The motel restaurant served a pretty good breakfast, modestly priced, and Dan ate there every morning. There was a Starbucks just a few blocks away, and I would go there for latte and a yogurt-fruit cup. I really enjoyed these morning walks, past the convenience store, the police station, and the Barnes Foundation, though the sky was generally gray. The amount and variety of activity in those few blocks was very intriguing to me. 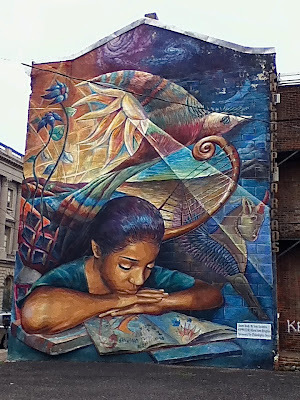 The last morning I pushed a little farther in order to see a mural a few blocks away. I thought it was lovely and made this photo on my iPod Touch. I really like Philadelphia, and I especially like staying in a busy part of town.